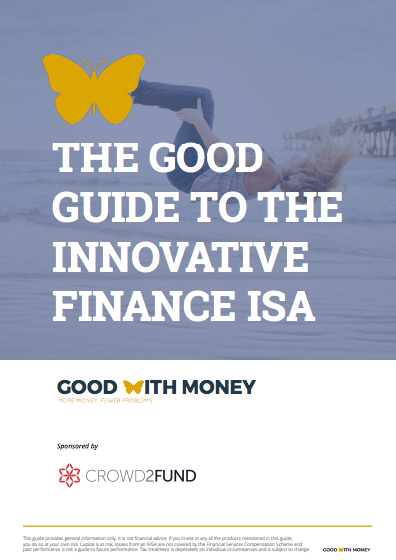 A new FREE guide from Good With Money spells out what the Innovative Finance ISA (IFISA) is all about, how it is different from other types of ISAs and how it might be used to diversify an investment portfolio and earn a competitive return. Three years since the introduction of the IFISA, Good With Money has relaunched its definitive guide to the tax-free savings account in collaboration with Crowd2Fund, to help both beginner and experienced investors navigate the newest addition to the ISA stable. 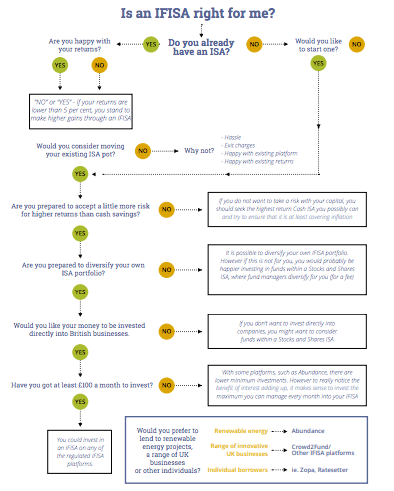 The guide includes Good With Money’s ISA Grid, which explains the entire ISA range in one handy table, as well as a step-by-step flowchart (below) to help investors decide whether an IFISA is right for them, all while fully understanding the risks involved. Editor of Good With Money Rebecca Jones said: ‘The majority of Britons still overwhelmingly opt to save in cash – despite historically rock-bottom interest rates. This is starting to change, however, and it is thanks in no small part to the introduction of the IFISA three years ago. The guide outlines the opportunities in the IFISA-eligible peer-to-peer lending universe, which offers investors the chance to diversify their portfolios by investing up to 10 per cent of their investable assets (as recommended by the UK Financial Conduct Authority) into innovative British businesses. ‘INVESTMENT, not deposit. The most obvious difference between an IFISA and a Cash ISA is that an IFISA typically has a higher rate of return. That’s because they are a riskier investment, rather than just a deposit account. ‘INTEREST, not equity. The main difference between an IFISA and a Stocks and Shares ISA is that Stocks and Shares ISAs purchase the equity of companies that are listed on an exchange, often via funds, on your behalf, rather than loans or bonds that pay interest. So with an IFISA, you don’t own equity in the business you are investing in, you are just lending it your money. ‘ILLIQUID, relatively speaking. If you buy shares on the stock market, you can usually sell them at any time, making them a “liquid” asset. With an IFISA, you are lending the money in anticipation of a certain level of interest over a fixed term, so your money should remain invested for the term. Consequently they are considered more illiquid than stocks and shares. The guide also weighs up the pros and cons of investing in an IFISA vs. a Cash or Stocks and Shares ISA. Rebecca Jones continued: ‘We like the IFISA because, crucially, this kind of investing helps us connect with our money. Seeing exactly where our savings are going and how they are helping small businesses with a product like Crowd2Fund’s not only makes for a talking point in the pub, but it’s empowering too. The guide also covers the risks involved, and how investing in an IFISA might complement a broader investment portfolio.